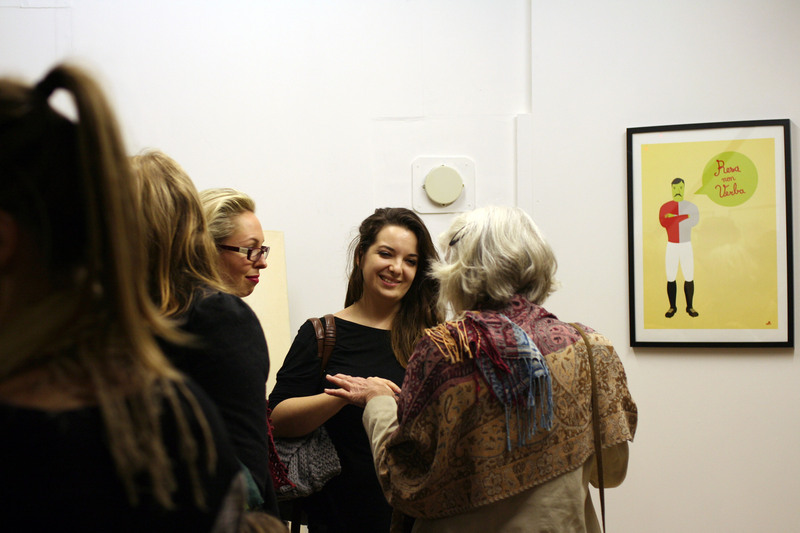 This past weekend saw the 2nd exhibition for the Open Doors Project. This one was based around the SW4 postcode, which is the Clapham area. It was held in a lovely, lofty-type space at the Clapham North Arts Centre and was filled with the artist’s impressions of SW4 and very rapidly, with happy art viewers. I got to show the first in my series of new work. 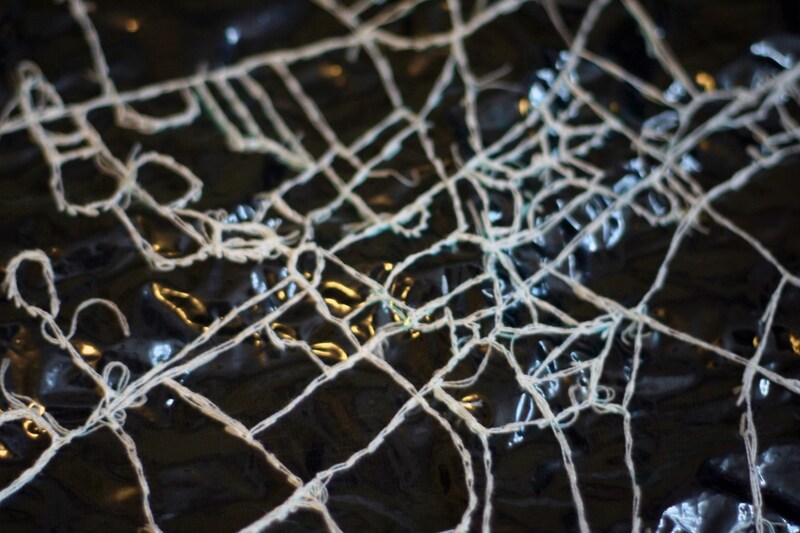 This series is embroidered and based on maps, but it still retains the ambiquity and web-like quality of my previous work. 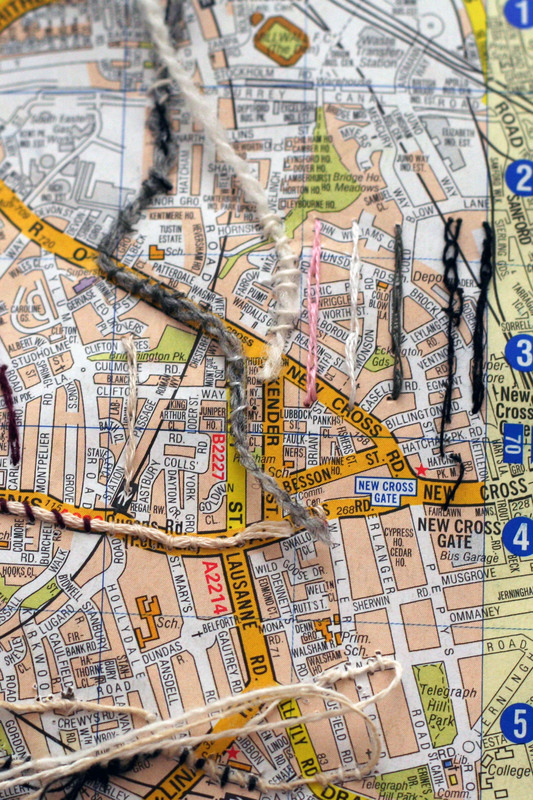 It’s based on a map of Clapham, Brixton, and Streatham where I used to live. 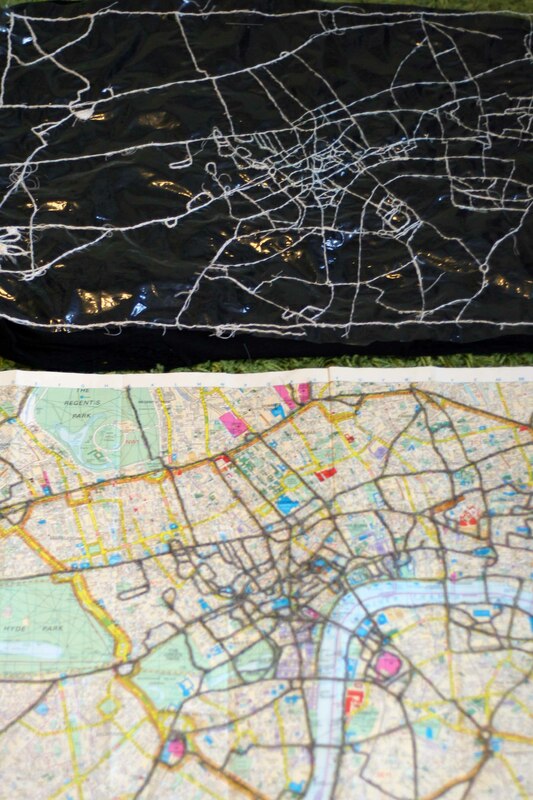 I’ve embroidered the lines of every street I’ve been on in the area. 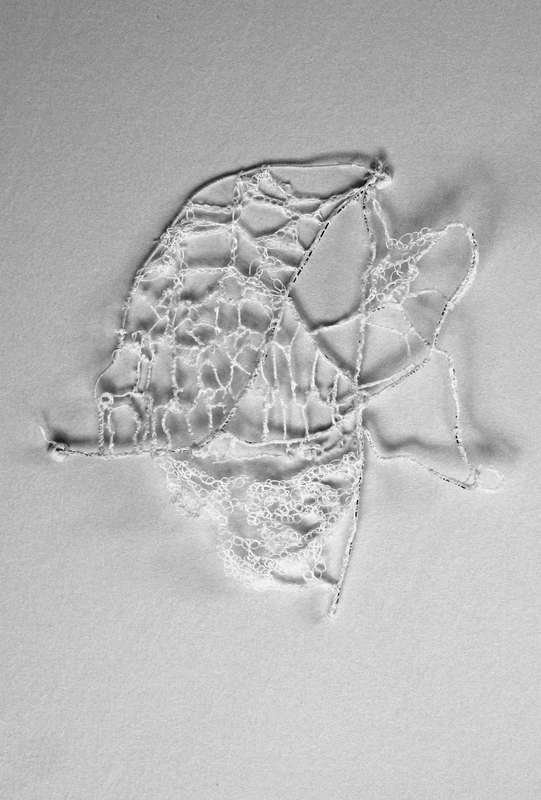 It was done on dissolve-able fabric wherein I embroider directly on the plastic-y fabric and when I’m done, I dissolve it and only the string is left. It allows me to do a lot more intricate work than I can with crochet. Unfortunately, the soluble fabric is super shiny and difficult to photograph. I finished embroidering the actual map and tried to get a side-by-side comparison, but the world (shiny fabric, short height, area constrained by a couch) conspired against me. I’m somewhat concerned about the eventuality of dissolving the fabric. The map is about the size of a poster and could get very easily tangled. This is also my first time trying this technique, so I do hope all my effort isn’t for nothing! I plan on trying to dissolve it over a bit of screen and then carefully transferring it to it’s final home (TBD). It’s been a really fun exercise in and of itself to trace where I’ve been in London. I do have a bit of a collection of London maps going and I really enjoy seeing the names of streets, seeing the paths, the roads, the haphazard lack of planning, and all the things that make London, London. I really like that anywhere you go, someone has been there before. I really like to think all of the infinitely intimate moments there have been that have since disappeared from the physical reality of London. It puts into perspective your own memories and fondness for parts of London and makes them feel small and meaningless because they’ll disappear too. At the same time, it makes them feel like an addition to the city and, especially for sad memories, that they too will pass. London is layers and layers and layers. It has taken 6 years for me to pick up what is advertised as a great work in American literature and I have to say, with that kind of lead up, it was a bit underwhelming. The storyline was a bit predictable, but generally it was a good, albeit tragic, tale of unrequited love (my favourite kind). What did interest me, is that the main characters consisted of a woman, her former husband, her child, the child’s secret father and the scarlet letter. The description of this embroidery is carried throughout the novel and is a huge protagonist and carrier of the plot. The tactile and visual symbolism of the embroidered letter is a literary ploy to signal the emotions of Hester Prynne and her turmoil at the hands of her fellow villagers. 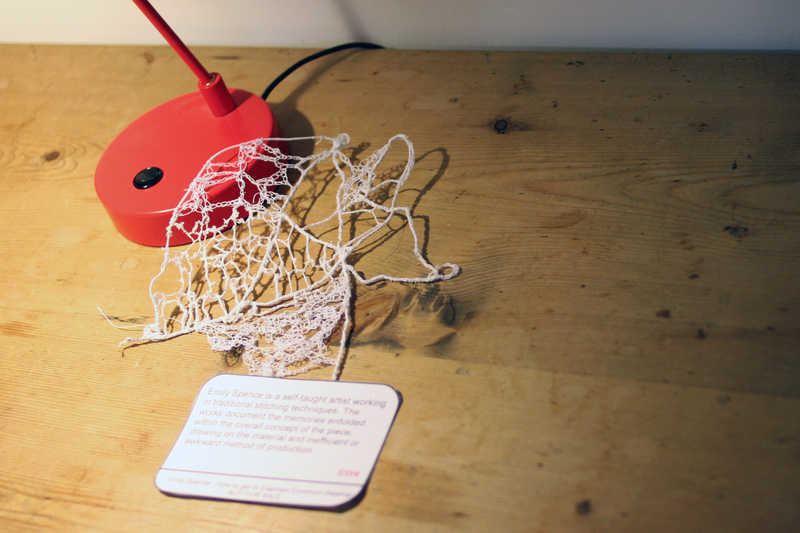 The book hangs on this embroidered letter, a textile. There were some obvious hiccups in the relaying of Hester Prynne- her dialogue taking on the awkwardness that only a man writing words for a woman who lived several hundred years previously could achieve and some fun self-indulgence in the language. However, I cannot think of (and implore you to inform me) of other novels that place textiles in such a prominent position.